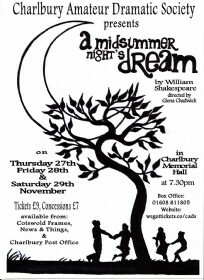 A Midsummer Night’s Dream’ is an enchanting (in every sense of the word) comedy. In the wood fairies rule but they themselves are quarrelling. Lovers flee there to escape from the restrictions of Athens and workmen come to get some peace to rehearse their play. When the fairy king tries to help sort out the lovers’ emotional problems everything goes horribly and hilariously wrong. The workmen also get involved in the fairy world and undergo experiences that they could only ever have dreamed of. In the end harmony is restored, true love triumphs and the workmen present their play to the court at the wedding celebrations-----that it is rather rough and shambolic only adds to the enjoyment. This will be a fast moving physical comedy is suitable for everyone. 41 Photos. Click thumbnail images to enlarge.